Expansion pack (requires Impossible Creatures Update v1.1). 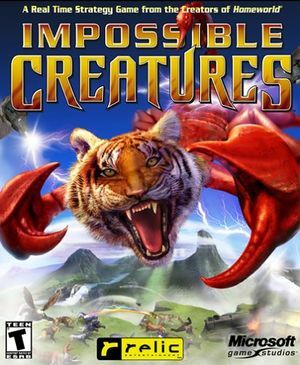 Impossible Creatures Update v1.1 - does not work on Windows Vista. Does work again on Windows 7 however. Delete or rename Nordic_Games.bik and relicintro.bik. Maximum resolution seems to default to that of the smallest monitor. UI issue can also occur with parts of the minimap becoming obstructed. Enabled by default. Running in windowed mode disables Vsync. Options menu has a slider for framerate. Function is unknown. Needs additional testing. In multiplayer games, it is possible to choose a player's color by repeatedly clicking a colored orb by a player's name. This recolors the structures that player builds and the icon on each of their units. ↑ 2.0 2.1 File/folder structure within this directory reflects the path(s) listed for Windows and/or Steam game data (use Wine regedit to access Windows registry paths). Games with Steam Cloud support may store data in ~/.steam/steam/userdata/<user-id>/324680/ in addition to or instead of this directory. The app ID (324680) may differ in some cases. Treat backslashes as forward slashes. See the glossary page for details. This page was last edited on 13 March 2019, at 15:40.